For most cultivators, it is a constant battle against mold and mildew. Realistically, grow environments and facilities set up the perfect conditions for mold and mildew to thrive - relatively high heat and humidity along with organic material. 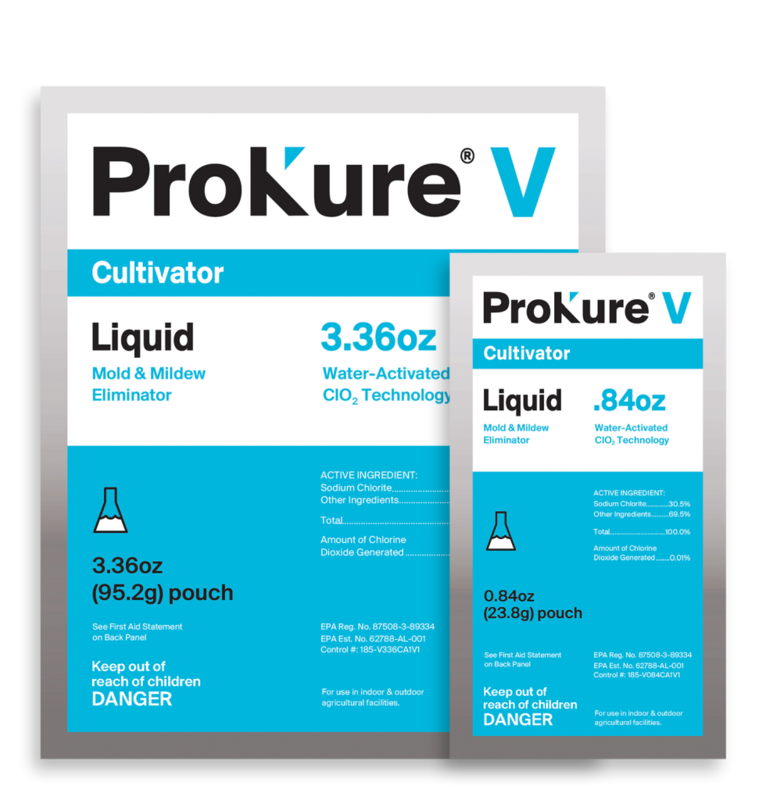 Our ProKure V product line is an EPA-registered, pharmaceutical-grade disinfectant/fungicide/ sanitizer/tuberculocide that kills mold and mildew with no residue and no rinse required. ProKure V uses innovative, cutting-edge ClO2 technology to disinfect, sanitize and deodorize all hard, non-porous surfaces. Read the entire label and use strictly in accordance with precautionary statements and use. 1. Tear open the foil package and remove the white inner pouch. (DO NOT OPEN THE INNER WHITE POUCH). 2. Add the white pouch in an opaque (not clear) bottle with the correct amount of water. 3. Allow the white pouch to activate in water for one hour to reach maximum strength. Suitable for use with plants in the room. Spray directly onto surface to be treated. Agitate and allow one hour before use to ensure solution reached full strength. Keep unused formula in a closed or sealed container in a cool, dark location that is not subject to any sunlight. Record activation date onto the container. Used stood formula within 15 days of activation. To disinfect hard, non-porous surfaces, ProKure V must be used with an exposure time of 10 minutes at 100 ppm.